A popular legend throughout the Allegheny Mountains is the legend of The White Lady of Wopsy Mountain also known as Wopsononock Mountain. The local people refer to the popular mountain as Wopsy Mountain. Some people believe there are two White Ladies, another White Lady that roams the Buckhorn Mountain road. Nobody really knows for sure. Although, John Hunter Orr of Altoona, PA, a collector of folk stories, thinks the story started with the Wopsy Mountain story and spread to the Buckhorn Mountain. There is also several legends of The White Lady of Wopsy Mountain. One legend reports the White Lady is looking through Wopsy Mountain for her baby. The baby was thrown out of the horse carriage while rounding Devils Elbow, a dangerous curve that still exists on PA Wospy Mountain. The legend says the baby was never found. Although, of course, the road has been much improved since the horse and buggy days. Drivers are still cautious when approaching Devils Elbow. I'm not sure it's because of the dangerous curve or the legend of the White Lady of Wopsy Mountain, most likely it's both reasons. You actually have to travel the road yourself to understand the eerie feeling you suddenly get when you approach the area. It seems everybody breaths a sigh of relief once you're down the mountain. Below is the most common legend of The White Lady of Wopsy Mountain. Both legends are very similar. They always begin with newlyweds getting in deadly accidents on the mountain's treacherous roads. Wopsy Mountain and the Buckhorn Mountain have several dangerous curves. The most famous dangerous curve is known as Devils Elbow. This is where the legend of the accident of the White Lady of Wopsy Mountain takes place. There have been a lot of accidents in the area of Devils Elbow. The dangerous curve has caused many experienced drivers to lose control, especially when the mountain is snow-covered and the roads are slick. The White Lady of Wopsy Mountain's story has the husband dying instantly. The wife regains consciousness only to find her beloved husband's decapitated body. Mr. Orr says the woman disappears into the woods, wandering around Wopsononock Mountain. She heads west towards Buckhorn Mountain. Yet, she always disappears around the deadly curve at Devils Elbow. She's been seen there many times by people traveling down the steep mountain road. Most sightings only last a second when you suddenly see someone in white on the side of ther road ahead but once you approach the area there is no one in sight. Sightings of the White Lady of Wopsy Mountain has been reported for many years by many people in the area. As the folk story goes, many people have seen a woman dressed in white, wearing a long flowing gown, standing along the side of the steep, winding Wopsy Mountain Road, near Devils Elbow. 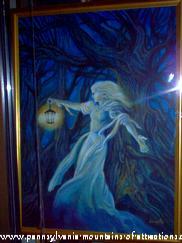 Some say she is holding a candle, others report she is holding a lantern.. Many testify to have stopped to offer her a ride down the steep mountain. Once inside the vehicle she seems grateful for the ride but quiet, she smiles a lot, and is extremely beautiful. It has been reported many times that when they look in their rear view mirror they can't see her reflection, yet when they turn to face her, they see her sitting in their back seat. Before the vehicle reaches the bottom of the mountain, in the area of Devils Elbow, she always vanishes into thin air. Wopsy Mountain also has a beautiful lookout area known as, Wopsy Lookout. You can drive your car atop the mountain and park and enjoy the view. You can see down over Blair County on a clear day. It is also known as Altoona's Lovers Lane. Another legend is that this Wopsy Lookout is a Lovers-Leap and couples have gone there to jump off the edge. I do know for sure that several people have parked there and taken their own lives. About 30 years ago I lived in another neighborhood and a neighbor girl took her life at Wopsy Lookout, nobody ever knew why. She parked there one summer evening and hooked up a hose to her exhaust and pulled the hose through her car window and died of carbon monoxide poisoning. It is also said that if you drive to Wopsy Lookout on a clear dark night the street lights below will spell out Altoona. The thick forest gets in the way of the view and some people think it's just a rumor, but I have received email from a couple of visitors that have testified that in the 70s you could visit Wopsy and, without a doubt, the streetlights spelled out Altoona. But, since the city has gone through changes over the years, you can now only make out a few of the letters. Regardless, Wopsy lookout is still a unique lookout with a beautiful view of the city below. It's still worth a visit,and who knows, you just might see a woman dressed in white hitchhiking along the side of the road! Here is an interesting story I recently received in an email from a young girl from Canada. She wrote to tell me that she has been having dreams since she was a child about a woman dressed in white. She had these dreams many times over the years and recently decided to research what this could possibly mean. She stumbled upon my website and the page about The White Lady of Wopsy. It totally freaked her out to see the paintings by Joe Servello, the woman in her dreams look exactly like the woman in Joe's paintings! In Sept. 2008 I received another email from a guy named Joe that lives in PA. He stated that 12 years ago he was visiting his girlfriend at the Altoona Penn State Campus and while traveling back home he and his friend, Paul, he was riding with, decided to travel over the Buckhorn Mountain, when he was near the Buckhorn Inn they both saw a woman standing along the side of the road dressed in a wedding dress. They could see her in detail all except her face. After about a quarter of a mile, once they both realized what they saw they decided to turn around a go back, just to make sure it wasn't someone playing a prank. Once they returned to the area they didn't see anyone, no cars, no people, nothing. After 12 years he is still amazed at seeing the White Lady of Wopsy. Thanks for sharing that story with me Joe. Buckhorn Mountain is well known in the area for many tragic car accidents. A few of my dearest friends died coming down the steep and winding mountain road. It is especially dangerous during the winter months. 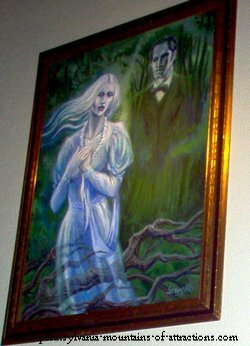 The legend of the White Lady of the Buckhorn Mountain has both the husband and wife dying with sightings of a woman in the white flowing gown, searching for something by candlelight. As you can see from the different paintings, Joe Servello, an extremely popular artist through the Allegheny Mountains, has really caught the images of the legend of both White Ladies. Joe is also known for using different medias of art to capture many historic sites through Altoona and the Allegheny Mountains. Many of these sites no longer exist, which makes his paintings an historic recording of the area. You can visit Joe's art gallery in downtown Altoona. THE WHITE LADY TAVERN HAS RE-OPENED UNDER NEW OWNERSHIP! The White Lady of the Wopsy Mountain legend is so popular in the area that not only artists and writers pay tribute to the folk story. A popular tavern in our area is named after the legend, it call The White Lady. It is located on the Buckhorn Road, and once known as the Buckhorn Inn. 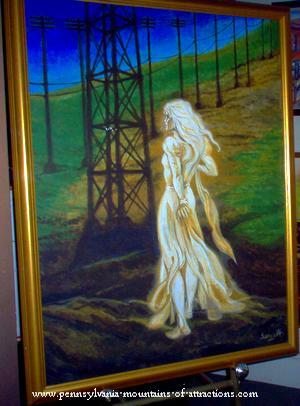 The new owner, Frank Fanilli, bought many of Joe Servello's paintings of The White Lady of Wopsy Mountain to decorate his new business. The tavern is now known as, The White Lady Tavern, the new owner, Frank Finelli, has done a beautiful job of remodeling the building and bringing the old building back to life. Not only is the food top quality, the people that work there make you feel right at home. 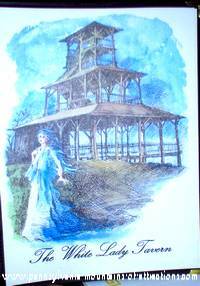 They love to share the legend of The White Lady of Wopsy Mountain or The White Lady of Buckhorn Mountain. The White Lady Tavern has been experiencing their own ghostly sightings, at least that is the scoop of local rumors. While you're in the area why not take a ride to historic Hollidaysburg and check out The U.S. Hotel , known as the most haunted hotel in the Allegheny Mountains. 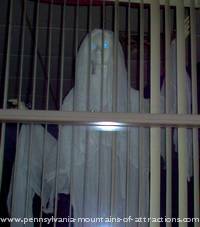 We have all kinds of PA haunted attractions through the Allegheny Mountains, spend some time in the area and look around, I'll bet you'll find something somewhere that give you a haunting experience.